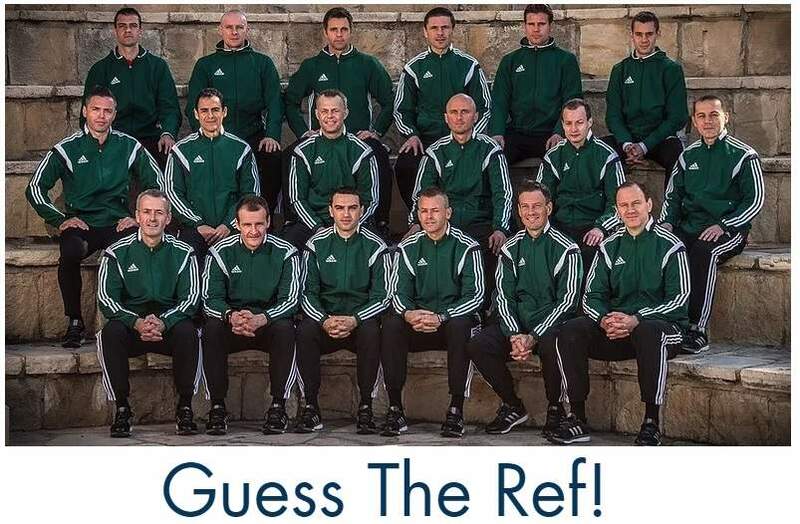 During the preparation for the Euro’s both assistants of Bjorn Kuipers will talk about their rol in the team, the preparation for an Euro 2016 game and they’ll share some tips for other assistant referees. Sander van Roekel has assisted Kuipers on the line for the first time in 2006 and since 2008 he’s contiously doing so. 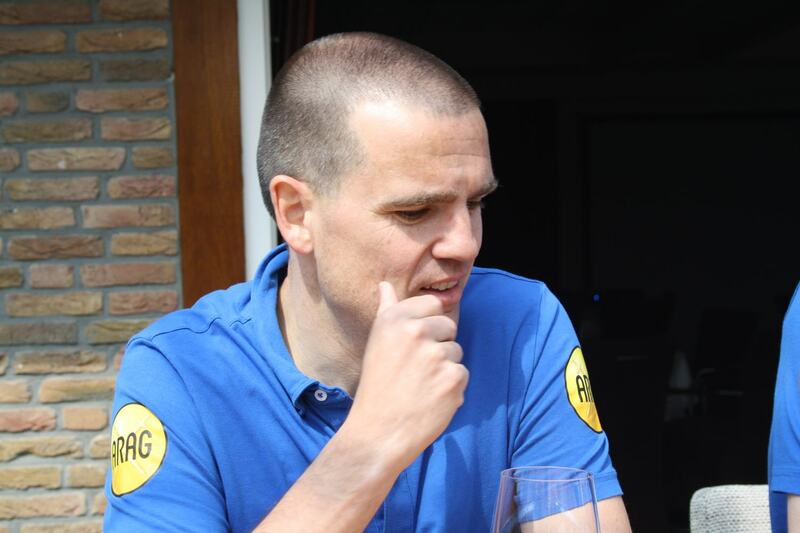 Erwin Zeinstra is part of Team Kuipers since 2011. Bjorn Kuipers is in the lead, followed by his assistants Liesveld (extra assistant), Erwin Zeinstra and Sander van Roekel. The First game for Team Kuipers is on the 16th of June 2016 when Germany plays against Poland, two “neighbours” that both have won their first game. The second game is between Croatia and Spain on the 21st of June. On the matchday the referees will have breakfast or lunch together. 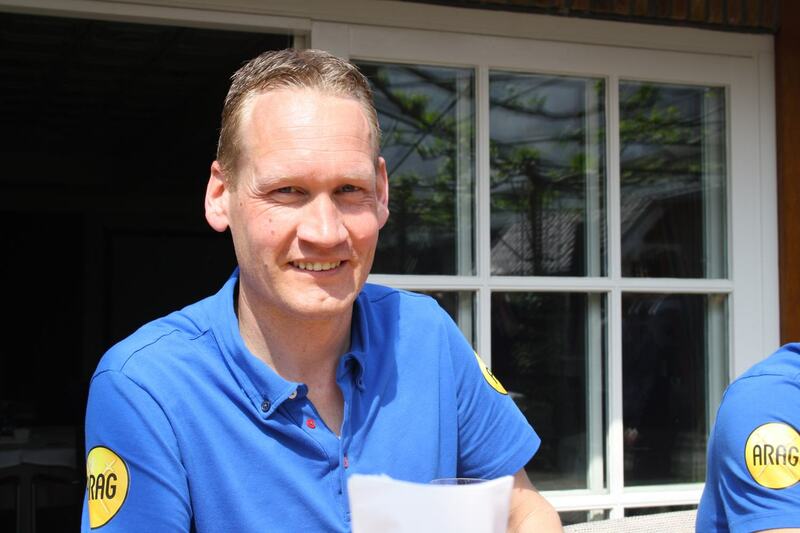 “During an evening game, as in the Champions League, we take a moment to rest in the afternoon”, says Zeinstra. “Everyone of us has his own way to relax.” After that they switch to game modus, adds Van Roekel. Right before the referees will leave the hotel they have a team meeting with all the referees of the game. They’ve watch some video’s at home or on their way to the host city in the plane or train. “We will then stress out what we expect from each other, what points deserve some attention for this specific game.” Small points as a reminder so they’ll keep focused. One and a half hour before the game Team Kuipers goes to the dressing room. Then everybody is quiet. Full concentration. That’s the ideal preparation for the team. At 21.00 CET Bjorn Kuipers whistles for the he start of Germany vs Poland. That’s when they need to be ready. The use of cue words like (focus, ball comes, etcetera) is way to stay concentrated. Check all 7 tips to stay focused for 90 minutes. The assistant referees of Bjorn Kuipers are very happy with the presence of the extra assistants behind the goal-line during the European Championships. They will focus more on the offences in the area of the assistant, roughly from the goal-line towards the middle line and from the sideline to the edge of the box. “I don’t have to pay attention to that as much”, says Zeinstra. It helps assistants to concentrate on judging whether a player is in offside position, their most important job. “With the extra assistant referees behind the goal-line we make less mistakes with offside. 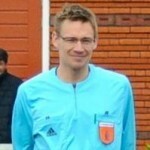 That was proven by the Euro 2012 stats”, adds Van Roekel. According to Van Roekel their biggest advantage is that they have experience as professional level as well. They did not make it to the top. “But we both have loads of experience with us because we made it to that level. I see more young AR’s and they start at much younger age. I think you would recognize situations better if you have a certain experience as referee. And if you’ve gained that experience, you can switch to a role as assistant.” Van Roekel does not referee at all any more. “I am no longer a center referee. We don’t have to follow the ball any more, we focus on the secondlast defender. That’s also why I don’t officiate friendlies any more. There’s also leisure time for referees. It fits perfectly in their training, fitness and evaluation scheme. Team Kuipers has time to talk together. It will be about the same stuff, they’re from the same age and all got young children. And they will also take some time to relax. “I’ll bring a movie or a book in my suitcase”, says Van Roekel. “Maybe even my hiking shoes to walk around the lake near our hotel”. A moment to rest, away from all the attention. 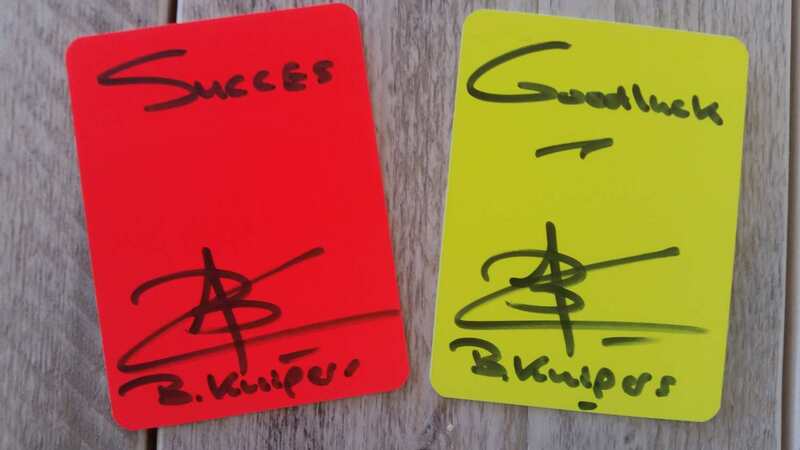 Want to win signed red and yellow cards by Bjorn Kuipers? All you have to share the best you ever got as referee via this form. Good luck!